Product prices and availability are accurate as of 2019-04-21 11:07:50 UTC and are subject to change. Any price and availability information displayed on http://www.amazon.com/ at the time of purchase will apply to the purchase of this product. There are some features about the pet clippers that makes it quite perfect for professional pet grooming. Pet lovers, especially pet store owners or people who often do pet grooming work can try this clipper, and you will not disappoint about that. Charge for 3 hours and it can be used for 5 hours. This battery inside the clipper is 2200Am lithium battery, featuring short charge, long power supply and long lifespan. That is why the clipper costs higher than others. Such short charging time and long using times is outstanding compared to other like brand products like Wahl or Oster. 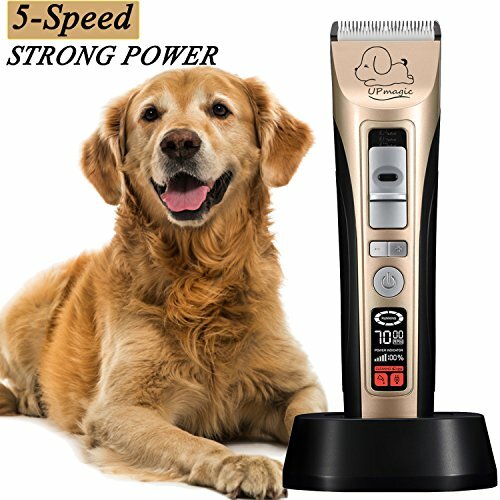 This professional pet clipper is equipped with powerful motor to do the heavy duty work. It have 5 speed options: 5000 RPM, 5500 RPM, 6000 RPM, 6500 RPM, 7000 RPM five levels.You can according to the size of the pet, the amount of hair and hair thickness selection speed.It cuts the thick hair quite smooth. 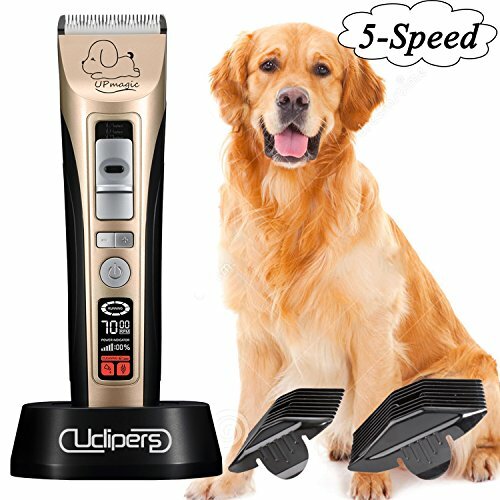 The clippers is perfect for thick hair dog, cat, rabbit or even horse. Normally speaking, the thicker the hair, the longer time the grooming takes. This clipper has the LED light to indicate the power. When the load is too large to affect the cut intelligent tip cleaning blade. When reached the running time intelligent prompt to add oiling for the blade. When the battery power is lower than 5% intelligent charging.With these function, you can use this clipper more assured. 4.Cordless and cord use are both available. The animal hair clipper aims to be more user-friendly. The rechargeable design helps you to get out of bother of cord. When the power of the pet clippers goes off, connect the plug to the clipper and it can be used. 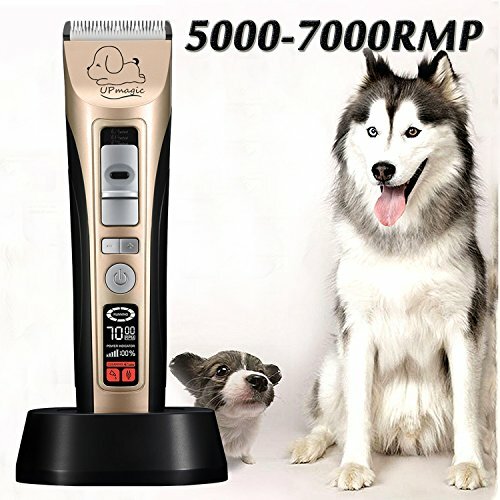 ?RMP intelligent control system.Five speed options: 5000 RPM, 5500 RPM, 6000 RPM, 6500 RPM, 7000 RPM five levels.You can according to the size of the pet, the amount of hair and hair thickness selection speed.The pet grooming kit is extremely proper for the heavy duty work. 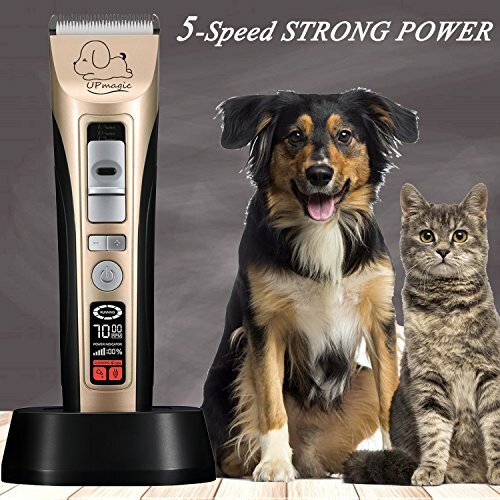 Dog, cats, rabbit, horse hair clipping can be done by this clipper. It can cut thick hair quite smooth. ?Humanization design. When the load is too large to affect the cut intelligent prompt cleaning blade. When reached the running time intelligent prompt to add oiling for the blade. When the battery power is lower than 5% intelligent prompt charging.With these function, you can use this clipper more assured. ?Super Large capacity battery long power supply. 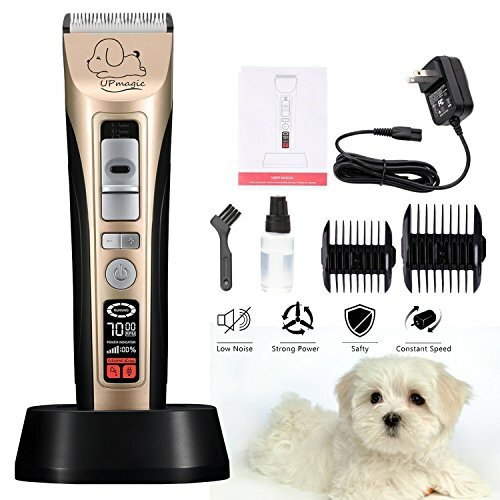 The professional pet clipper is built in a 2200mA Li-lion battery. Only charge for 3 hours and can be used for 4 hours. Such long using time for one full charge is perfectly suitable for the professional grooming animal. ?Quiet clipping and trimming. The motor of the pet grooming clipper is imported from Germany and runs much quieter than like products on the market. In addition, our ceramic and stainless steel blade also produce less noise than common double stainless steel blades that will not produce any noise when doing the hair clipping. Even when the pets are sleeping, it can work well and not to disturb the animals. ?Adjustable ceramic and stainless steel blade. This professional clipper has three sizes of adjustable blades of 1.3mm/1.6mm/1.9mm. With this design you can easily decide the length of hair you are going to leave without the aid of comb. And accessories included two comb,3mm/6mm/9mm/12mm,you can choose the comb according to you want .